A complete and authentic issue of the National Anti-Slavery Standard, New York, June 29, 1843, 4pp., disbound, VG. Front page report “Runaway Slaves Arrested in Illinois” reports of the capture of two Missouri fugitive slaves found and arrested in Illinois enroute to Canada. Several abolitionist related reports and editorials. National Anti-Slavery Standard. 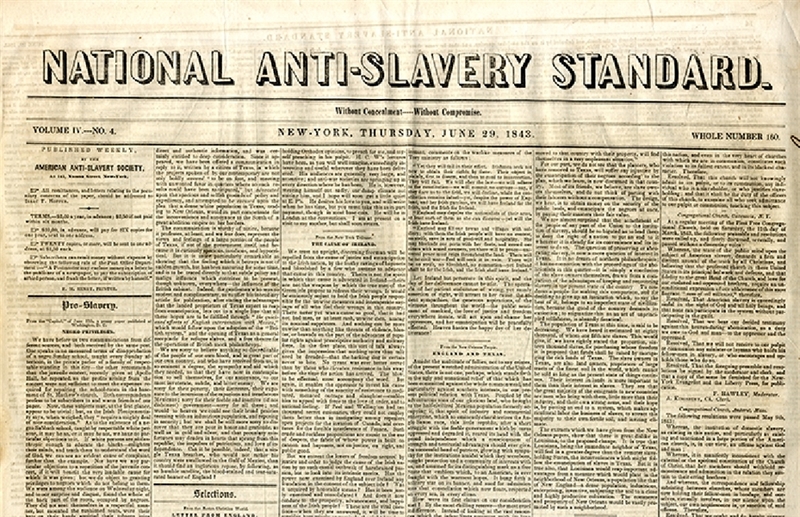 National Anti-Slavery Standard was the official weekly newspaper of the American Anti-Slavery Society, an abolitionist society founded in 1833 by William Lloyd Garrison and Arthur Tappan to spread their movement across the nation with printed materials.